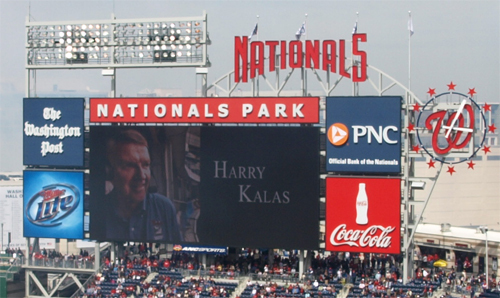 WASHINGTON, D.C. — While milling around Nationals Park yesterday, Fritz got a surprising text message from a friend that Phillies broadcaster Harry Kalas had collapsed and died. As details began to emerge, we determined that the ambulance we saw on the way into Nationals Park was probably for Kalas. The Nationals had a moment of silence for Kalas just before the start of yesterday’s game. I have been a fan of Kalas for a long time, though it was from his work with NFL Films and network radio telecasts of NFL games. It seemed like whenever we would drive out to cut down a Christmas tree in the country, we’d listen to an out-of-market game on Mutual that Kalas was doing. I also enjoyed his NFL Films narration. I might have seen him doing Phillies work a few times over the years and for some reason I remember watching a Cubs vs. Phillies game that went to rain delay Kalas joined the Cubs broadcasters for some lively banter — that’s good rain delay theater if you ask me. Lastly, my great Uncle Bill, a lifelong Philadelphian and baseball fan (originally the A’s until they moved to Kansas City, then the Phillies) used to correspond with Kalas regularly. After Uncle Bill died, his family discovered these letters. Kalas later acknowledged Uncle Bill’s death on air. Kalas will be missed. I’m glad he got to call a Phillies championship live last season.